Many graduates were happy to walk across the stage to receive their diplomas, but probably none more so than Doug Koehler. In fact, he’s happy just to be walking. Koehler just had returned from his national guard unit’s deployment in Iraq. He had a full-time job, and he and his wife Lauren welcomed their daughter Kara to the world. A serious car accident in 2007 brought his life to a halt. He suffered extensive injuries and spent weeks in a coma. His fractured hip was held together with pins. After his long recovery, he took a job as a teacher’s assistant at Plainfield Central High School. It was work he loved, but he wanted more. He wanted to teach. 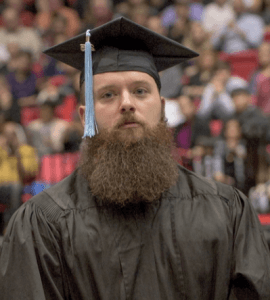 He began taking classes at night, and received his associates degree. But his car accident injuries came back to haunt him. He underwent hip replacement surgery just before he began taking classes here fulltime in 2012. Koehler was eager to begin student teaching this fall semester and had a great placement lined up at Gregory Middle School in Naperville. But on the fourth of July this year, while riding home from work, he was struck by a drunk driver. His pelvis was fractured. But amazingly, his hip replacement held. Koehler thought there was no way he’d be able to begin student teaching in less than two months. But he was determined to try. The principal agreed to accommodate his teaching from a wheelchair. It turns out that wasn’t necessary. He began walking just three days before he stood in front of his first class. Sunday, Dec. 13 Koehler earned his degree in special education — a role model to his future students, and an example for all about what it means to never give up.